I woke startled by the unfamiliar surroundings. Panic set in as my heart quickly outpaced my racing mind. I peered cautiously over the edge of my elevated bed and spied my sleeping parents on the pull-out couch below me. A few feet beyond them, in the groggy darkness, I could not make out my little sister sleeping in the built-in bunk but I knew she must be there. Then, just as the first slanted rays breached the horizon and pierced our camper’s drawn shades, my location dawned on me. We were in Arizona. Now that I had remembered where I was, my anxiety yielded to excitement. This wasn’t just any ordinary day. This wasn’t even just any run-of-the-mill vacation day. In fact, it was my birthday, as in, “MYYYY BIRTHDAAAAY!” It was my sixth to be exact, and my enthusiasm defied containment. I could not allow my parents to get away with sleeping for one second longer. I rolled over to the edge of my bunk again, peered down at them and shouted, “Happy Anniversary!” because it was, but also I hoped it would prompt reciprocal wishes for my birthday. My dad shook awake with a start, slapped his tongue against the roof of his mouth and croaked out a “happy birthday.” My mother groaned unpleasantly from behind her rotund belly. I couldn’t understand why she insisted on keeping her eyes closed ON THIS MOST EXCITING DAY! Several extremely boring hours later. . . So I did. What a sucky birthday. Not even the majesty of the Grand Canyon could make up for the utter birthday boredom. I rounded up my sister and while the two of us stood in the lurching bumping teeny excuse for a kitchenette, we tried to come up with a game that would keep us entertained. But, the half-gallon apple juice in the unsecured refrigerator planned a sneak attack. At a particularly large jolt, the juice flew off the shelf like the previous summer’s “ET: The Extra-Terrestrial” from a new West Coast Video store. I ducked just in the nick of time and the jug landed on the counter and slid to an innocent stop. Thereafter, my sister and I tasked ourselves with securing the loose fridge door. We found an empty cardboard box that had been flattened and we propped it up against the handle. Voila! Door secure. Ish. We were so proud of ourselves for solving the case of the murderous juice that we meandered the whole three feet up to the captain’s chair and began to tell our parents the tale. My parents started to turn their heads towards the center but before either of them made eye contact with me they both stopped when their eyes caught the spot of carpet between their chairs. My dad stopped the camper immediately. Suddenly their expressions turned from patronizingly inquisitive to sheer terror for leaping from that small spot of carpet were huge plumes of flame. My parents exchanged some excited and tense words none of which I can remember exactly. The next thing I know, my mother said, “Well you can stay here, but I’m taking my babies and getting the hell out.” She grabbed my sister and I and sprinted as fast as a pregnant woman with two small kids can. Thus ended the vacation with the camper from hell and my sixth birthday, which indeed was THE MOST EXCITING DAY EVER! Happy birthday, America the beautiful! 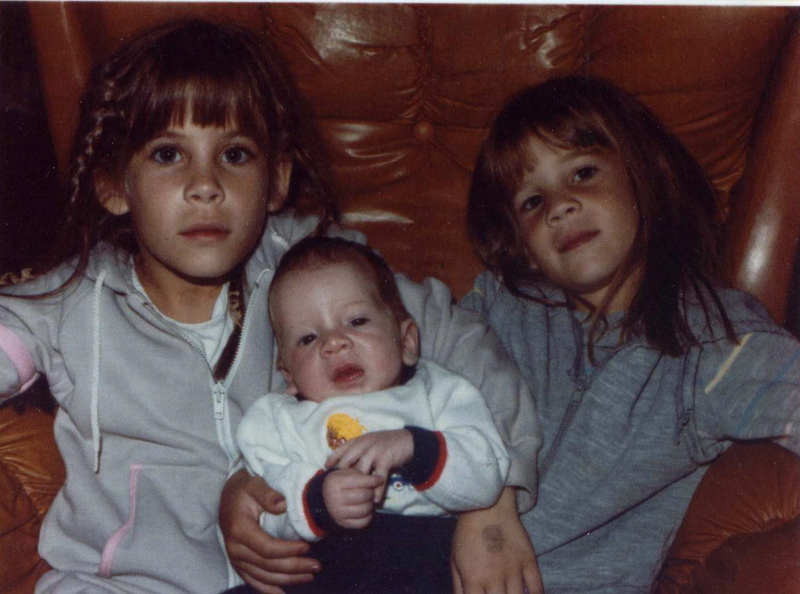 A picture of the three of us exactly 13 months later. Author’s note – my six-year-old self’s memory is not so keen. I am sure I’m confusing separate days from the same three-week vacation. 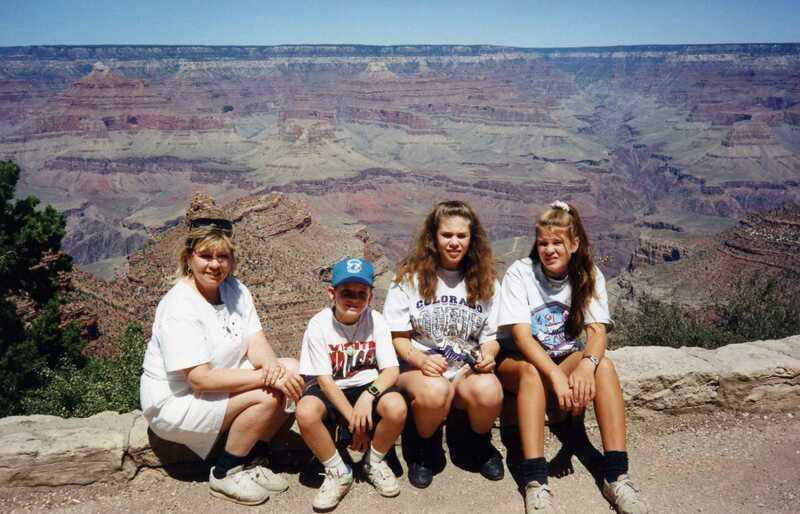 10 years later we revisited the Grand Canyon but sans camper! It was a rented camper! I can’t remember what became of it. But we never did vacation again in a camper.